Throw pillows are a great way to spruce up a home for less. You can add in pops of color or just create a more luxurious look with pillows. You probably have some lying around. Maybe the material is outdated or worn, but don't toss them just yet! Make a new cover for them in a few minutes using hot glue. Yes, hot glue! I wish I knew how to sew, but I don't. So I improvise. My original plan was to use Dritz Liquid Stitch. You can find it at most craft stores. Mine is from Hobby Lobby and with a 40% off coupon it cost $4.19. 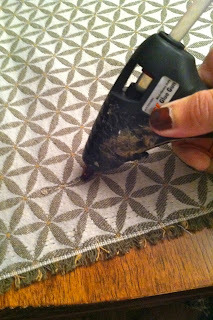 You'll soon find out I decided to ditch the Liquid Stitch in favor of my trusty hot glue gun. 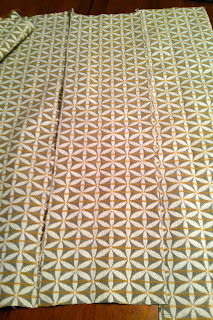 I purchased two yards of fabric from Hancock Fabric. I always head toward the back of the store where they have piles of leftover fabric majorly discounted to $5 per yard. The fabric is high quality and thick. Just the kind you want for any type of upholstering or diy projects. I was able to cover three pillows and a chair cushion with the two yards. 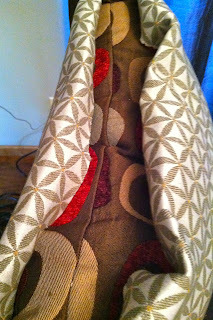 I had to piece together some scraps to cover the last pillow, but it worked out fine and that side can face the back. I was going to use a tutorial from LiveLoveDIY, but then I stumbled across this tutorial from Ashton Sebastian and it was much simpler. She uses Liquid Stitch in it, but if you read the beginning of the post you'll find that hot glue is her preferred method. 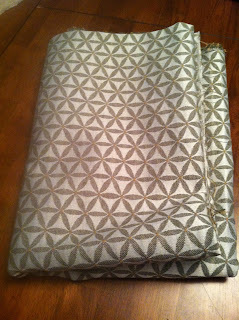 You'll want to lay your pillow on the fabric and then fold the fabric over the top to figure out how much you need. Leave about one inch on each side. When in doubt, always leave more. You can trim the excess later. As you can see here, I left a couple inches of overlap, but it ended up being more than I needed. 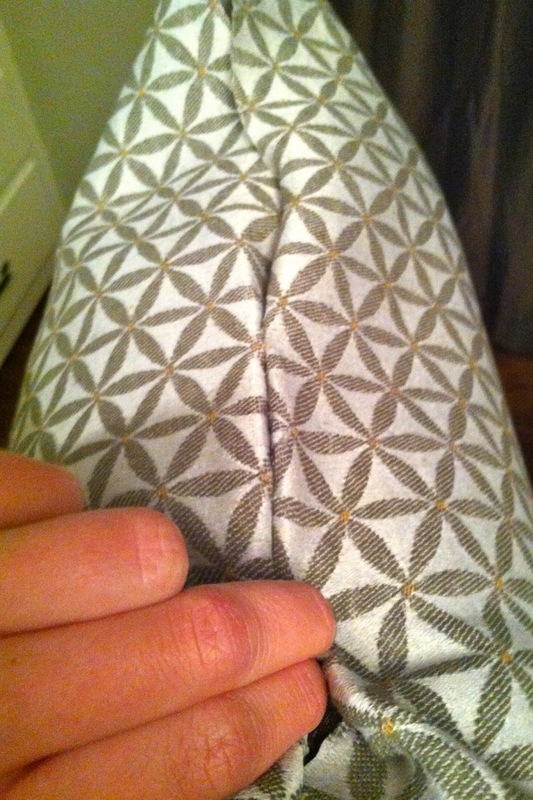 Make sure the inside of your fabric is facing out and the nice finished side is facing in. Eventually you'll turn the fabric inside out which is how you get the nice looking seam. You will have one side that is done already since you folded the fabric over. 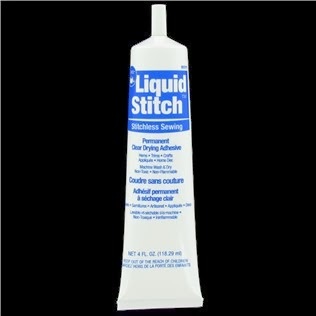 Apply the Liquid Stitch or hot glue in a straight line to the two sides that connect with the folded over side. The glue creates your seam. Do not finish the side that is directly across from the folded one yet. As you can see I started using Liquid Stitch, but I quickly changed to hot glue. The Liquid Stitch took all night to dry so I couldn't finish the project until morning. 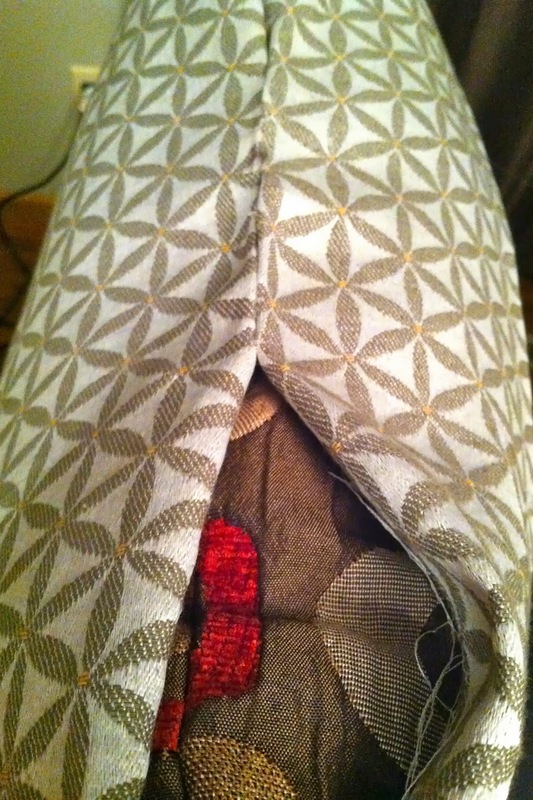 Even then, the seam didn't feel as sturdy as the seams I created with hot glue. Once you have glued the two sides and the glue has set up, turn the pillow case inside out so the nice side of the fabric is now facing out. Tuck your pillow into the cover. Now comes the hardest part. You'll need to glue the final seam with the pillow inside. Fold the edges over and work in small sections gluing them as you go. This seam won't look as nice as the others, but you can face it towards the bottom when you arrange the pillows. One down, two more to go! These pillows came with our downstairs couch. I've never been a fan of the pattern so they have sat in storage for a couple years. I'm glad I didn't throw them out because they're big thick pillows. 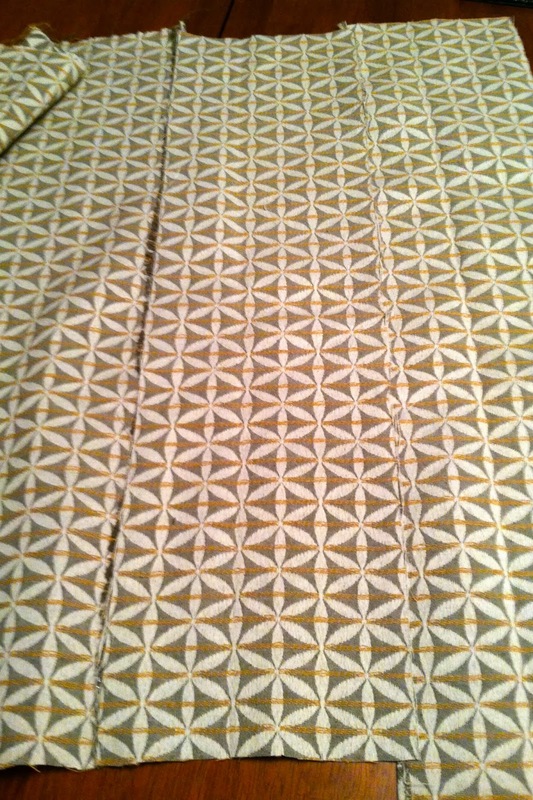 Now with the new fabric, I love them! Here they are on our daybed in the upstairs office. I'd like to add new fabric to the two long white pillows below. They had a tan covering on them that accidentally got bleached. Those ends might be tricky! I'm still debating what color fabric would look best. Any ideas? 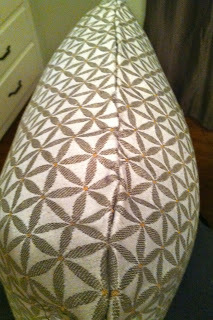 Now find some fabric and update those pillows! Happy Thanksgiving! I'm off to Savannah!